The Sharks are coming back home! It’s been a slow month for the fans situated in Gothenburg. The team has been playing two double headers away but they will squeeze in a double header home before the month is over. The newcomers Sölvesborg Firehawks will visit Shark Park Saturday 28th of June! Sölvesborg had a terrible start of the season but managed to catch some wins. They are six for fourteen, same as Karlskoga Bats. The Gothenburg Sharks had a terrible set of games on the road versus Karlskoga and Sundbyberg. Lets hope that they can just forget about the games in Karlskoga and bring the offense back home from the Sundbyberg into the important double headers versus Sölvesborg on Saturday and get back into the series before it is far too late. Karlskoga has had some really good seasons the past years. Runner up in 2013 (lost the final vs Stockholm) and winner 2012. They were knocked out by the Gothenburg Sharks in the semi final 2011. Things have gone a bit slow this season though. Six wins after 14 games. Two of them versus the Sharks the first of June. The Sharks lost game one 10-0 after the Karlskoga, at times phenomenal, pitcher Paul Waterman shut down the Sharks completely. He allowed no hits, two walks and was noted for 8 strike outs. Kim Berglind started game one for the Sharks. He’s normally found in Uppsala but reinforced the Sharks. He allowed five hits and two runs in five full innings. Kristoffer Örjelund took over the mound in the sixth giving up three hits and seven walks in two and two thirds innings. Wilhelm Sundin took the Sharks and pitched a third of a inning but failed to prevent the tenth run (Kristoffer was responsible) and the game was ended premature in the eight. Game two was pitched by the Karlskoga import Parker Talbert the first six innings allowing only one hit and Simon Andersson finished the Sharks off with a clean top seventh inning with one strike out and no hits, giving Talbert the win after Karlskoga scored 11 runs during the initial six innings. Jason Norderum and Hiba Nabi pitched game two. Jason gave up an unusual three earned runs (six scored during the first six) and Hiba added four earned and one unearned. During those seven innings the Sharks failed to get on the board heading back to Gothenburg scoreless. Some two weeks later, on the 14:th of June, the Sharks travelled to Sundbyberg. Sundbyberg Heat have had a good 2014 season. They are one game behind Leksand Lumberjacks and four games behind the leaders Stockholm Monarchs. 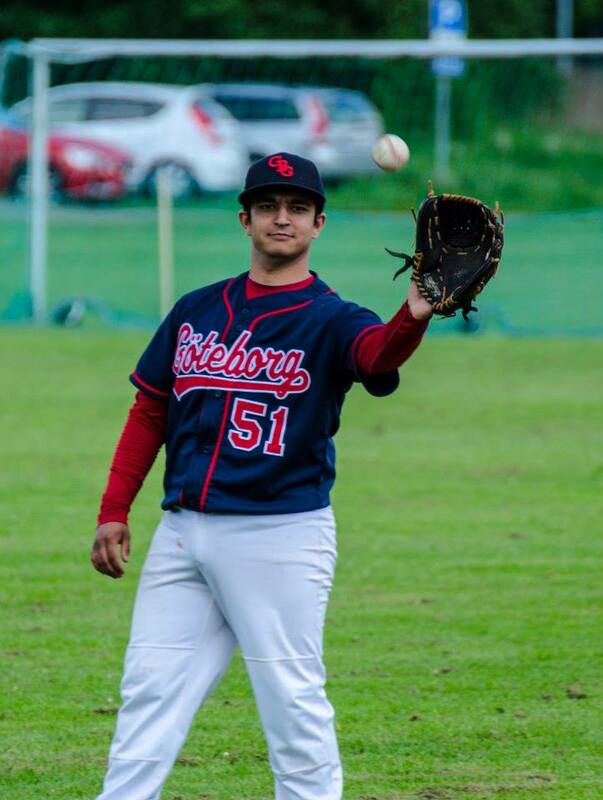 The games vs Sundbyberg was the first one for Spencer Kreisberg who made his first appearance in the Swedish Elitseries since 2012 (playing for Karlskoga Bats). The Sharks lost the game 16-6 after seven innings. The frustrating part is that the Sharks let 16 runs of which 11 wasn’t earned! Spencer started on the mound for Gothenburg and had to see the Sundbyberg cross home plate ten times. Only one of those ten runs was earned. Hiba relieved one inning and had to let six runs of which four was earned. The game was ended premature in the seventh. Joe Lankford, and Spencer scored twice and Norderum and Melendez scored once. A multi hit day for the reinforcement Simon Tysk. Runs batted in by Laffin, Tysk, Melendez and Olivia. Game two just want’s one that Gothenburg was supposed to win. Pitching wasn’t working, defense wasn’t working and the bats wasn’t working. Exception to that was the top of the batting order where Joe and Spencer did what they could. Both scored runs and both had extra base hits. Runs batted in by Laffin and Spencer. Patrick Laffin have struggled this season. Half way through it his average has dropped from over .400 last season to .282 just now. He had 17 walks last year and halfway through this year he’s down to 2. Patrick is one of the keys to the Gothenburg offence, so lets hope that the numbers are going back to what they were last year and his team mates follow. This entry was posted in Baseball and tagged Gothenburg Sharks, Karlskoga Bats, Sölvesborg, Sundbyberg Heat on June 22, 2014 by Marcus. Finally! The first game of the season is history and we can look forward to a new season of baseball! The Sharks travelled to Stockholm for the first game. Stockholm had already begun their season with double header versus Leksand the previous week. Stockholm won those two games comfortably. Jason Norderum started pitching in game one for the Sharks. He let one run, which wasn’t earned in the four innings he pitched. Eventually, Gothenburg let 10 runs, only giving up five hits. The amount of walks Gothenburg gave up turned out to be costly. The Claesson’s of the Stockholm pitching staff gave up four hits and two walks which the Sharks failed to capitalize on. Game two were cut early due to the weather but they managed to squeeze in five innings. Gothenburg put themselves up on the board in the third inning when Jason hit a single to the right, where both Joe Lankford and Simon Tysk managed to score! Stockholm started game two by giving Hiba a severe headache. Stockholm scored no less than six runs in the first and four in the second. They managed to score once in the third, but the bleeding stopped there. However, those runs in the first and second was more than enough to put Gothenburg in the backseat and Gothenburg failed to recover. Gothenburg did as Leksand the week before, left Stockholm empty handed. While Gothenburg was visiting Stockholm, Leksand won two games vs Karlskoga Bats. Karlskoga lost game one 10-0 and the game lasted only until seven innings. Game two was quite the opposite and was a tight game where Leksand came out on the front winning 2-1. Sölvesborg who lost two games to the Akademin in their opening game got a visit from Sundbyberg. It was Sundbybergs first game of the season and they were pumped! Scoring no less than 17 times in game one. The second game got a bit tighter where Karl Knutsen pitched the entire game for Sölvesborg. 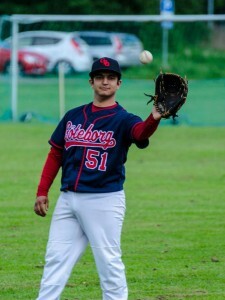 Sundbyberg’s national team player Philip Gajzler drove in a two run homer in the ninth and set the final score to 4-7. Leksand will go on the road and visit Gothenburg Sharks home opener on Shark Park. You are welcome to join us watching the ceremonial first pitch of the season and two exciting games! Please note that game one starts at 12. This entry was posted in Baseball, Elitserien, Gothenburg Sharks and tagged Gothenburg Sharks, Karlskoga Bats, Leksand Lumberjacks, Sölvesborg, Stockholm, Sundbyberg Heat on May 5, 2014 by Marcus. Sundbyberg Heat has two fewer games played than Stockholm and are four games behind. Two wins would take them a bit closer. Sundbyberg needs to take the upper hand on Gothenburg to advance further. They have Gothenburg, Stockholm, Alby and finally Gothenburg in the remaining eight games. Sundbyberg has wins versus all teams in the top teams (Stockholm, Karlskoga and Leksand) this season and is currently holding third place in the series. The Sundbyberg pitching has been their best weapon and worst enemy. They kept Karlskoga from scoring early in the season and Michael Andersson only allowed five hits in that game. When their defense somewhat failed them, the offense has been there to pick up wins. They have scored ten runs or more in six of the seasons 14 games this far. In half of them, they allowed five runs or less. Gothenburg needs to get a good feeling in the team before the play offs to stay in the Elitseries start. In theory Gothenburg could get a play off spot with back to back wins in the remaining eight games and Sundbyberg may not win more than two games in their double headers vs Stockholm and Alby. The same thing works vs Leksand but Leksand must not win more than one game in the four games vs Alby and Karlskoga. It would be wonderful, but with the Sharks track record for this season unlikely. Starting with a win in game one vs Sundbyberg would be a great start to the remaining eight games! Joe Lankford had some extra practice this weekend when playing with the Elitserien Allstars in Nordic Baseball Classic. Best of luck to the team the upcoming weekend! This entry was posted in Uncategorized and tagged Gothenburg Sharks, Sundbyberg Heat on July 8, 2013 by Marcus.